During my research into the names of our war casualties already on our monument, I came across others that possibly should be honored there too. Some of the names came from newspapers, some from people who contacted me, some from other references that I found. After considerable research, I suggest that the following 16 are perhaps qualified to have their names added if Stevens County and the American Legion decide to update the monument. Originally the monument was designed to hold 156 names. After removal of the name Stanley Backer, who I believe is the same person as Stanley Packer, there will be only seven spaces left. At the very least, these 16 need to be remembered too and that is my purpose here. Update: NeWGS spearheaded a project to update the monument with these names. The monument was re-dedicated Veterans' Day 2013. Read about the project and ceremony. I reported on the next soldier in the February 2012 issue of this publication as his body was sent back to the states with two other soldiers whose names are already on the monument (Joseph Christman and Edgar Theobald). Perhaps his name should be on the monument too…. Pvt. Ernest Davis was killed in action 27 September 1918, age 24, in the battle of Argonne (the same day as Willis Oaks). He was born 7 March 1894 in Caney, Kansas, to James Roll and Lola (Mayer) Davis. The family was living in Indian Territory in Oklahoma in 1900 then moved to Ferry County in 1904 arriving by train at Boyds. James Davis was granted a homestead in March 1910 for 160 acres in the Deadman Creek area. Davis Lake is named for him. Ernest attended the Godfrey school across the Kettle River from Boyds until the Sherwood school was built along the State Road in 1906 (Deadman Creek area). 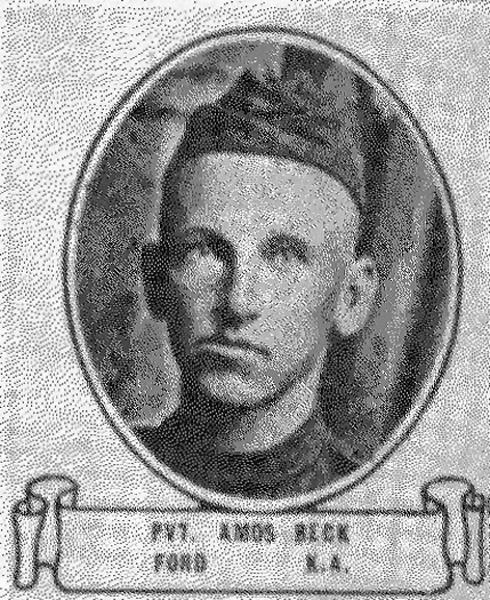 He entered service 14 June 1918 and was sent to Camp Lewis. He was first assigned to the 157th infantry but was later transferred to Company D 109th infantry in September. He sailed for France 8 August 1918 and his regiment was immediately sent to the front. His body was sent to Colville in September 1921 and he was buried at Highland Cemetery where his parents are also interred. Pfc Edgar Eugene “Gene” Moore, age 20, was killed in action 15 June 1951 while serving as a member of Weapons Company, 1st Battalion, 5th Marines, 1st Marine Division in Korea. He was born 31 December 1930 in Kettle Falls to Edward G. and Constance (Price) Moore. He attended grade school in Colville and high school in Northport. The family is listed in the Boyds precinct in 1940. 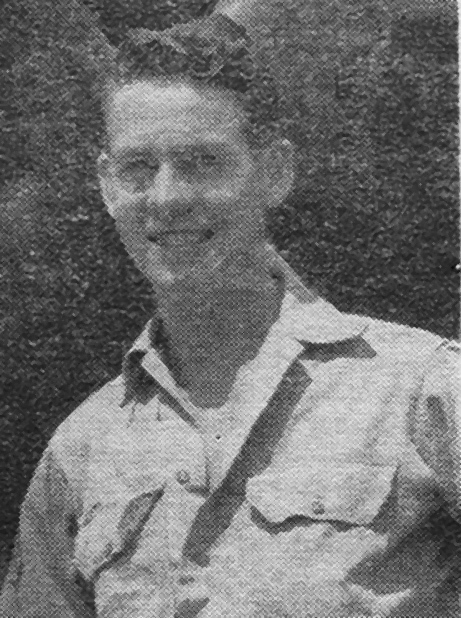 Gene enlisted in August 1950 and was sent to Korea the following January. His body was returned for burial at Highland Cemetery in November 1951. He was survived by his parents, one brother and his grandfather, Dean Price of Northport. 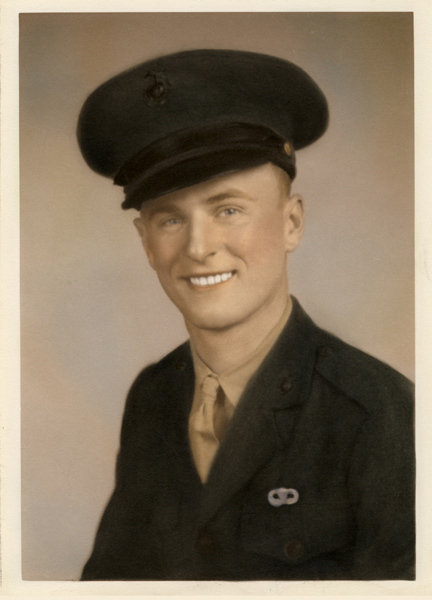 Private First Class Moore was awarded the Purple Heart, the Combat Action Ribbon, the Korean Service Medal, the United Nations Service Medal, the National Defense Service Medal and the Korean War Service Medal. As we all know, we are once again at war and we have once again lost more Stevens County boys, this time in Afghanistan and Iraq. Army Spec Ryan Michael Bell, age 21, was killed 5 March 2007, when an improvised explosive device detonated near his unit during combat operations in Salahuddin province, Samarra, Iraq. He was assigned to the 2nd Battalion, 505th Parachute Infantry Regiment, 3rd Brigade Combat Team, 82nd Airborne Division, Fort Bragg, North Carolina. Five other soldiers died in the same explosion. Ryan was born 24 April 1985 in Portland, Oregon, to Michael and Sheryl Bell, but listed his hometown as Colville when he enlisted. He graduated in 2003 and dreamed of becoming a doctor. He graduated from Riverside Military Academy in Gainesville, Georgia, and joined the Army in May 2004. Before he was deployed to Iraq, he served with his unit in New Orleans after Hurricane Katrina. Bell liked the outdoors, singing, dancing and watching sports. His father indicated that Ryan was "a walking sports encyclopedia." He was survived by his wife, Terri Bell; stepchildren, Jason and Tyler; his mother Sheryl Vickery, of Spokane; and father and stepmother, Virginia Bell, of Colville. Chief Warrant Officer 2 Benjamin Harris Todd, age 29, died 26 January 2009 from wounds sustained when two OH-58D Kiowa Warrior helicopters crashed in Kirkuk, Iraq, during a night reconnaissance. Three others died in the incident. He was assigned to the 6th Squadron, 6th Cavalry Regiment, 10th Combat Aviation Brigade, 10th Mountain Division, Fort Drum, New York. Benjamin was born 4 October 1979 in Colville to Alan B. Wiley and Marti Todd. He lived his early life in Orient until the age of ten when his family moved to Colville. He completed his education there in 1997 where he played high school football and joined the local search and rescue unit as a teenager. He enlisted the first time in March 1999 and was stationed at Fort Benning, Georgia, serving two tours in Afghanistan with the 1st Battalion 75th Ranger Regiment. He had re-enlisted in October 2004 and again in January 2005. While on leave in 2004 he met Shelly Gordon and they were married in April 2005. He graduated from flight school in June 2007 and was deployed to Iraq in October 2008. He had wanted to fly since he was nine years old. Benjamin was survived by his wife, Shelly, daughter Ashlyn, mother Marti Todd of Colville, father Alan Wiley of Orient; and brothers Nick and Daniel. He was awarded the Bronze Star posthumously for acts of valor in combat. He is buried at Mountain View Cemetery in Colville. There is also a monument in Arlington National Cemetery with the names of all four soldiers who were killed in that crash. 1st Lieut. Forrest Pinkerton Ewens, age 25, was killed in action supporting Operation Enduring Freedom 26 June 2006 in the Pech River Valley, Afghanistan, when his all-terrain vehicle struck an improvised explosive device during combat operations. He was assigned to the 1st Battalion, 32nd Infantry Regiment, 3rd Brigade Combat Team, 10th Mountain Division (Light Infantry), Fort Drum, New York. Forrest was born 15 Apr 1981 to Michael and Carol Ewens. He spent some of his early years in the Gig Harbor area near Tacoma. In 1992 the family moved to the Summit Valley area where Forrest and his twin brother, Oaken, and other brothers, Eli and Steven, attended the Summit Valley School and then Jenkins High School. He graduated with the class of 2000 and went on to graduate from Whitworth College in 2004. While at Whitworth, he married 1st Lieut. Megan Jagelski. Forrest was a talented athlete in track, football and wrestling and according to his friends and teachers, an “incredible leader.” He is to be remembered as an outstanding young man of character and purpose by students and faculty alike. 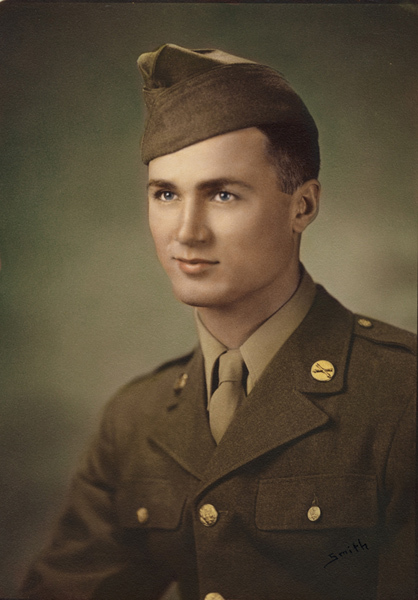 Forrest was awarded the Bronze Star and the Purple Heart and is interred at Arlington National Cemetery in Virginia. Staff Sgt. Wyatt A. Goldsmith, age 28, died 15 July 2011 at Camp Bastion Hospital, Afghanistan, of injuries suffered when insurgents attacked his unit with rocket-propelled grenade fire in Helmand province, Afghanistan. He was assigned to 3rd Battalion, 1st Special Forces Group, Joint Base Lewis-McChord, Washington. Staff Sgt. Goldsmith was a combat medic treating an Afghan commando when the attack happened. He lost his life in an effort to save someone else’s. He was a Green Beret soldier, serving his third overseas deployment, and was the recipient of three Purple Hearts. Wyatt was born 21 September 1982 in Redmond, Washington, the son of John W. and Lorie L. (Torgerson) Goldsmith. He attended grade school in Kirkland until 1994 when the family moved to Colville. He was a 2001 graduate of Colville High School and a member of the 49 Degrees North Ski Patrol. Wyatt entered service in the U.S. Army in June 2004 as a Special Forces recruit. He is survived by his, parents, John and Lorie Goldsmith, Colville; and by his sister, Nicole Goldsmith, Seattle. He was posthumously awarded the Bronze Star Medal, Purple Heart, and the Meritorious Service Medal. He is buried in the Mountain View Cemetery in Colville. This ends the stories of these heroes. If any family member would like a copy of my research, please contact me at research@newgs.org and I will be happy to share it with you. I again want to express my thanks to all those families that shared information about their loved ones. These soldiers and their families need to be remembered for their courage and sacrifice.